Created by their apparel partner Addidas, “Geeked Up” shirts are a line of tees featuring NBA players in cartoon design. After winning the 2015 NBA Title, the NBA geeked up the Golden State Warriors. 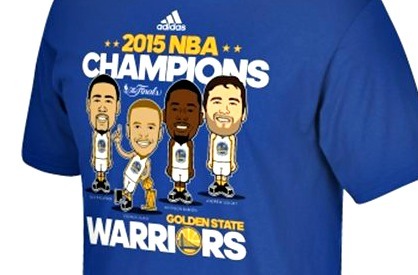 The shirt has four Golden State Warriors on the front with “2015 NBA CHAMPIONS” emblazoned at the top. The players in all their geeked-up glory are Klay Thompson, Stephen Curry, Harrison Barnes and Andrew Bogut. Clearly the shirt’s design was planned out way too early, otherwise Andre Iguodola would have replaced Bogut (or Barnes so they could keep the white guy). The Addidas store in San Francisco is also selling the individual ‘Geeked Up’ Klay Thompson and Steph Curry player shirts. Both players are in the same poses as they are above. Only large sizes remained and the shirts were relatively expensive at $32, but the biggest problem was that the Geeked Up Steph Curry doesn’t even resemble Curry. 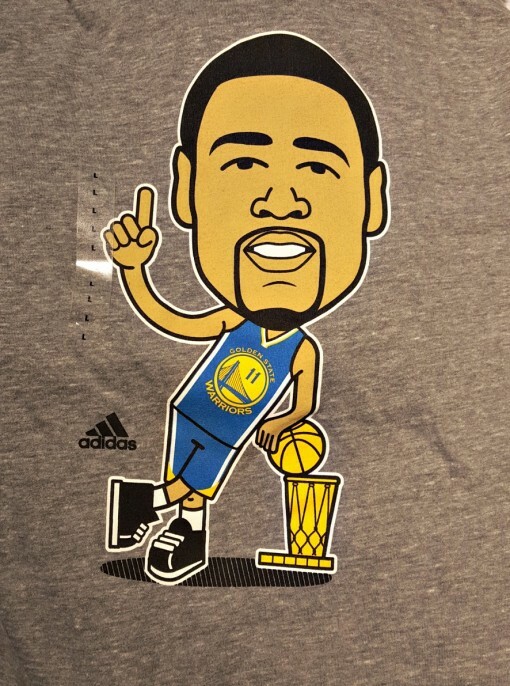 On either his individual shirt or on the team shirt, I can’t even tell it’s Curry other than…. who else could it be? Klay looks like Klay. That’s definitely Barnes and Bogut, but when did Curry ever have light reddish-brownish hair?